This peak is #85 on the Height List for Alaska . 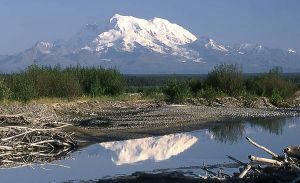 This peak is #25 in Prominence List for Alaska .An extinct, glaciated, stratovolcano located north of the Dudina River in Wrangell-Saint Elias National Park. The standard route is the southwest ridge, a technically easy climb with some crevasses.